This entry was posted on February 2015 by Rose Lanaro. The team at Henry Schein Dental is eager to help you find out what your practice’s main challenges are and expose the objective points of data that will lead you toward the best solutions. Henry Schein Dental’s Business Discovery Surveys and the Digital Practice Analysis Tool allow us to gather important information about how to improve your practice’s overall performance. In 2009, we set out to effectively state and address the challenges that were affecting dentists across the country. In order to do so, we surveyed over 13,000 dentists. The results of this survey should not be a surprise to many of you because they represent common issues that you may be experiencing on a daily basis. Of course, a full detail of solutions to these issues above cannot be addressed without knowing the specifics of your practice. I can assure you that our sales team is prepared to help you find solutions to the most commonly identified problems in your practice. Our team participates in career development courses, which requires them to complete over 350 hours of dental business training. 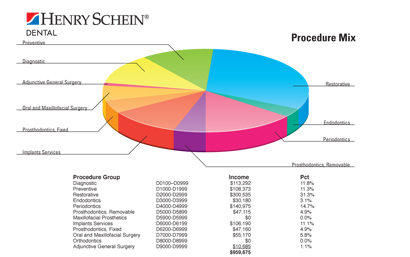 Using Henry Schein Dental’s offerings and tools, our sales force can help you identify your challenges and define solutions. We would like to start by sitting down with you, asking questions and most importantly, listening to your concerns. Today, we are helping our current and future customers uncover challenges and work toward actionable solutions. In over 10 years, we have mastered analyzing dental practices and have concentrated on creating tools to help you grow, sustain, or sell. One tool we are extremely proud of is the Digital Practice Analysis Tool (DPAT). By using a few pieces of information from your practice management software, we are able to show you how your policies and procedures are playing out in your practice. Of course, all the results are confidential. We examine many aspects of your practice to see how they influence your standard of care. The chart on the previous page shows you just a few of the many aspects the DPAT focuses on. Using your current fee schedule and our statistical analysis, we explore with you the possibilities of changes in your fee structure that could involve major financial gains in your practice and evolve into you receiving the fees that you deserve based on your efforts, education, and risk in owning a practice and small business. In addition to showing you what you could financially achieve, we can also discuss possible impacts to your patient base and help you in coaching your team to discuss fees and fee changes with your patients. How often should your patients be seeing you? That’s your call as an expert and doctor. One of the common pitfalls in a practice is the follow-up in communicating with patients. It is often an eye-opening experience when dentists are able to see how many patients are actually coming back twice a year to see their hygienist, and how many true hygiene days that department is filling. Henry Schein Dental Sales Consultants are trained by well-respected practice-management consultants on how to effectively get patients in the chair and keep them there. It’s often a surprise to see a year’s worth of you and your team’s efforts summed up in one chart, and the information here is amazing. Using coding, you’ll see what percentages certain aspects of your offerings are representing in regard to production. See the Procedure Mix example above. Obviously, one can see that the DPAT is unique in how it measures the effectiveness of your policies and procedures, and it’s been built based on your challenges and your needs. Basically, anyone can forecast rain; the challenge is partnering with someone who can help you “build the arc.” We’re prepared and excited to help you bring your practice into the future that you desire and help you sustain the practice you’ve worked so hard to create and grow.